← Design Culture Salon 10: How is the urban cyclist designed? Debates about transportation, how we choose to move around in the city, have become increasingly tense and fraught of late. The question of how you get to work, particularly if it is by bike, is a loaded one, which can reveal a host of attitudes to gender, citizenship, empowerment and age. The identity of the ‘urban mobile cyclist’ is charged with tensions in which design plays a crucial role. These tensions were palpable on Friday evening as a packed audience gathered for the first of the third series of Design Culture Salons at the V&A Museum to address the question of ‘how is the urban mobile cyclist designed?’ The discussion was lively and punctuated with outbursts of humour and enthusiasm, countered by moments of vented anger and frustration. It was a topic which captured strong opinion. 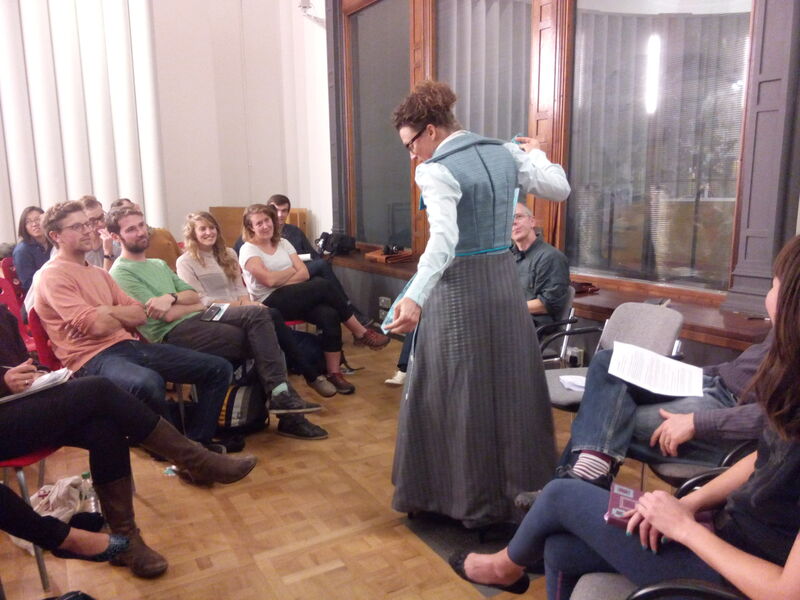 Kat Jungnickel demonstrating her cycling costume based on a design patent lodged by a woman in Bristol in 1897. In her opening statement, chair for the evening Kat Jungnickel from Goldsmiths University, London, introduced the relationship between citizenship and cycling which would recur throughout the ensuing conversation. The identity of being a cyclist is something we have to work hard to achieve, she said. Importantly, the cultural work involved here has a long historical trajectory, which is often hidden from mainstream view. Jungnickel spoke about her recent work on the ‘bikes and bloomers’ project, which traces a new design history of cycling for Victorian women in Britain. These women were viewed as both socially and physically dangerous by stepping outside the accepted norms of gender and mobility. By researching design patents for cycling costumes lodged by women at this time, Jungnickel has identified attempts by these women to negotiate fixed social and cultural boundaries. She generously modeled one such design for the Salon audience, which she had hand made from a design patent lodged by Mary-Anne Ward of Bristol in 1897 (pictured above). This formed a vivid and emotive introduction into the formative relationship between materials, design, citizenship and gender which steered much of the subsequent conversation. Panel from left to right: Rachel Aldred, Carlton Reid, Kat Jungnickel (chair), Justin Spinney and Jenni Gwiazdowski. The next to speak was Rachel Aldred, Senior Lecturer in Transport from the University of Westminster. Aldred made two inter-related points in her response to the evening’s question, which dealt with idea of cycling as a dangerous or ‘liminal’ activity and notions of exclusivity. In contemporary society, ‘cycling’ is generally viewed as a healthy, good activity whereas ‘the cyclist’ is often presented as anti-social and annoying figure. We currently have very narrow regulations on cycling in the UK which remain woefully outdated. Questions of competency and safety are fixed on the visibility of cycle clothing, lights, gear and other paraphernalia, which make the act of cycling a highly materialistic and gendered performance. She also spoke about the importance of re-thinking the relationship between cars and bikes, arguing that cycling regulations and transport modelling often relate the two. We tend to analogise cycling problematically, she argued, to either driving (so cyclists as squashier cars) or to walking (so cyclists as dangerous pedestrians). Carlton Reid, the next speaker, picked up on these central themes of citizenship and exclusivity, but also spoke more directly from his extensive knowledge of the cultural history of cycling. Reid uncovered much of this history in the writing of his book, Roads Were Not Built for Cars, which establishes a longer trajectory for attitudes to cycling and explains how it has always been an exclusive activity governed and controlled by an elite group, namely white, middle class men. Going back to gender, he described how Edith Wharton, the New York society novelist, erased her identity as a ‘cyclist’ from her diary in the later years of her life. Fascinatingly, Reid also addressed the relationship between cars and cycling, arguing that the emergence of normative car culture actually evolved from many aspects of cycling- including the process of fixing, which was first learnt through the mechanics of the bicycle. Finally, Reid proposed that there will be no quick-fix solution to the design of the urban mobile cyclist, which should be the product of a longer term cycling culture. Designers should aim to build this cycling culture as a priority. The bicycle needs to become a national symbol, he said. Jenni Gwiazdowski, founder and director of the London Bike Kitchen brought a new perspective by speaking from her experience of initiating a new model of education around bike repair from her workshop in Hackney, London. Here, Gwiazdowski sees education as a method of empowerment. It is not a shop, she said, but a learning space where people can begin to feel more comfortable and confident about understanding and relating to their bike. She made a profound statement in suggesting that ‘how we treat our bicycles says something about how we see ourselves and each other’. Again, the issue of value, both social and material, was raised. It is clear that some of the social hierarchies around forms of transport present a problem. People are afraid, ‘terrified’, of their bikes and of their incapacity to fix them. Danger, again emerged as a theme. Allowing people to work with their hands and gain a material appreciation for fixing culture was one method of overcoming this fear. The final speaker, Justin Spinney, lecturer in human geography from the University Cardiff, returned to the idea of exclusivity in a focused and precise way. There is an inherent uniformity in the production of the bicycle both as an idea and a physical object, he argued. It always has two wheels. It is always designed for the middle aged, middle class, white male as a vehicle for commuting or for professional racing. Where are the spaces in between and why are these not being designed? Design has therefore been part of the problem inhibiting the movement of the urban mobile cyclist, but it can also be the agent for change, he suggested. The figure of the great white male, the recent protagonist of Grayson Perry’s New Statesman issue, again came into view. He quoted from a recent design paper which defined the ideal bicycle as ‘innovative engineering, ergonomics in an aesthetically attractive package’, to illustrate the narrow cultural attitudes which underpin bicycle design and production. Spinney seemed to be suggesting that the project of re-designing the urban mobile cyclist should also be a project of expanding our imaginations in relation to mobility and citizenship. By this point, many hands were raised and the Salon opened up to a vibrant discussion between the panellists and the audience. Questions circulated around many of the central themes that had already been brokered. One audience member argued that the invention of a cycling culture would necessarily come from the margins, as a form of protest, rejecting the idea of centralised change. Others raised questions about the design of wider sets of infrastructures, including housing and schools, in relation to cycling. These systems are mutually dependent and inter-related. This reminds us of the necessarily interdisciplinary nature of the debate around cycling, which also needs to take place at high level. The panel was pleased to quash some myths, including that London roads are too narrow to accommodate cyclists. While it was satisfying to hear this refuted, (London’s roads are among the widest in Europe), it also served as a reminder of some of the important challenges around communication. In conclusion, the Salon brought into focus the tensions and urgent concerns which are currently driving a new conversation about mobility, age, migration, citizenship and consumer behaviour in relation to urban transport. These are all themes we look forward to returning to and working out in the rest of this series. The next salon is on 14 November 2014 and will address the question: ‘How do fashion cycles and design culture interact?’. Book here. This entry was posted in citizenship, gender, mobility and tagged citizenship. Bookmark the permalink. 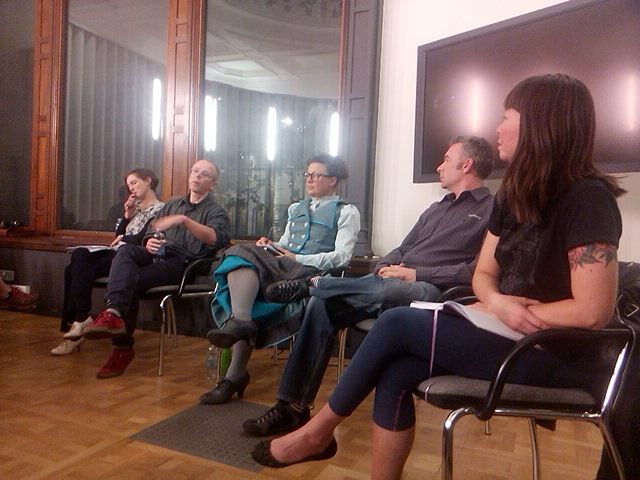 4 Responses to Reflections on Design Culture Salon 10: How is the Urban Mobile Cyclist Designed? As I pedalled my navy blue Halfords imitation vintage bike to work this morning (wearing my green Old Town suit to work this morning, trying to look as sartorial as possible, but failing because, not least, I was wearing a fluorescent tunic on top of it and a blue helmet) it occurred to me that it was strange that no one mentioned http://www.copenhagencyclechic.com and all its spin-offs at this Salon. Cycling is currently designed in the UK to make us look as un-chic as imaginable. The http://www.copenhagencyclechic.com sets out to communicate cycling as an everyday way of life rather than a sporty pursuit while drawing attention to its fashion elements. It makes me think that cycle commuting can be much more stylish than currently undertaken. Twenty-five years ago, before the internet and email, but while fax machines didn’t really work, London, and other major cities, was criss-crossed by cycle courier riders carrying documents across town for rapid delivery. Sometimes you’d see these dressed as, for example, Spider Man or Mary Poppins. I used to love how during the winter festive season, some would dress as Father Christmas.